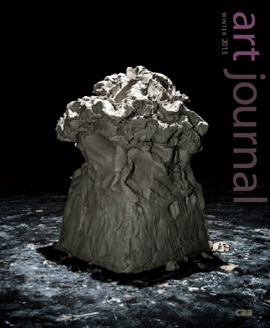 “Sexing Sculpture: New Approaches to Theorizing the Object” is the forum topic in the latest issue of Art Journal, now in the mail to subscribers. The forum was organized by Jillian Hernandez and Susan Richmond and features essays by Rachel Middleman, Nicholas Hartigan and Joan Kee, and Gordon Hall; artist portfolios by Rachel Lachowicz and Lily Cox-Richard; and a conversation between Jennifer Doyle and David Getsy. “Queer Formalisms: Jennifer Doyle and David Getsy in Conversation” is available as free content on Art Journal’s website. Also available in full online is Tina Rivers’s review of Are You Experienced? How Psychedelic Consciousness Transformed Modern Art by Ken Johnson and Psychedelic: Optical and Visionary Art since the 1960s, edited David S. Rubin. CAA seeks nominations and self-nominations from two individuals with specializations in medieval, Renaissance, or Baroque art to serve on the jury for the Millard Meiss Publication Fund for a four-year term, July 1, 2014–June 30, 2018. Candidates must be actively publishing scholars with demonstrated seniority and achievement; institutional affiliation is not required. The Meiss jury awards grants twice a year to support the publication of book-length scholarly manuscripts in the history of art, visual studies, and related subjects that have been accepted by a publisher on their merits but cannot be published in the most desirable form without a subsidy. CAA reimburses jury members for travel and lodging expenses in accordance with its travel policy. Candidates must be current CAA members and should not be serving on another CAA editorial board or committee. Jury members may not themselves apply for a grant in this program during their term of service. Nominators should ascertain their nominee’s willingness to serve before submitting a name; self-nominations are also welcome. Please send a letter describing your interest in and qualifications for appointment, a CV, and contact information to: Millard Meiss Publication Fund Jury, College Art Association, 50 Broadway, 21st Floor, New York, NY 10004; or send all materials as email attachments to Alex Gershuny, CAA editorial manager. Deadline: May 10, 2014. The American Alliance of Museums sent the following email on March 25, 2014. Important Update: The deadlines for legislators to sign the Tonko/Lance/Slaughter/Grimm and Gillibrand/Blunt Office of Museum Services appropriations letters have been extended until THIS FRIDAY, MARCH 28. We need to redouble our efforts in the next few days to make sure every Representative and Senator hears from the museums they represent, asking them to sign on to these important funding letters. As we have shared in recent Alliance Advocacy Alerts, these six champions are circulating letters among their colleagues in the House and Senate in support of funding for museums nationwide through the Office of Museum Services (OMS) at the Institute of Museum and Library Services (IMLS). If any of your legislators are NOT yet on these lists, please contact your Representative and Senators TODAY and ask them to please sign the letter supporting museum funding through the Office of Museum Services. You can use our Legislator Look-Up to identify your Representative and Senators. If they have already signed on, please say THANK YOU. You can call the Capitol Switchboard (202-224-3121) and ask to be connected to your legislators’ offices. You can also thank them on Facebook and Twitter, and find your legislators’ Facebook pages and Twitter handles in their profiles in our online Directory. Thank you for taking action on this important, and time-sensitive, issue! The National Humanities Alliance sent the following email on March 25, 2014. Last year, the House Budget Committee called for the complete elimination of funding for the National Endowment for the Humanities in its budget resolution. By sending messages to elected officials, advocates like you helped to defeat the proposal and preserve critical funding for the humanities. Now, you can help ensure a brighter future for federal humanities funding by urging your elected officials to join a bipartisan effort to support NEH. By signing on to House and Senate Dear Colleague letters, your Members of Congress can demonstrate support for NEH funding to the appropriations committee members that hold the agency’s future in their hands. Click here to send our message to your elected officials today. They are waiting to hear from you. It is critical that you act now. The deadline for Representatives to sign on to the House letter is Monday, March 31, and the deadline for Senators to sign on to the Senate letter is Friday, April 4.